A tourist region in southwestern Turkey was shaken by a 5.3-magnitude earthquake on Tuesday, the American geological institute USGS said, but local authorities did not report any victims or damage. 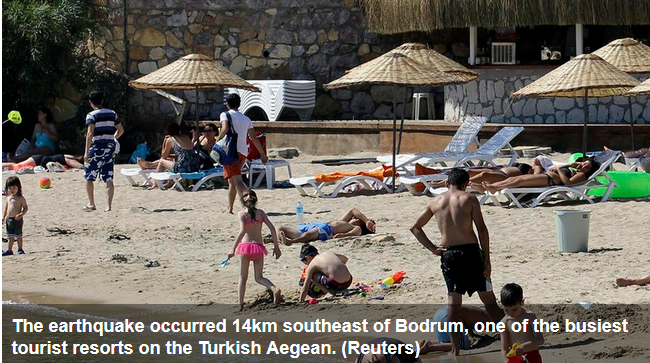 The earthquake occurred 14km southeast of Bodrum, one of the busiest tourist resorts on the Turkish Aegean, at a depth of 10 kilometres, USGS said. Several residents fled their homes for fear of buildings collapsing, according to NTV, a Turkish television channel. Last month, two foreigners died and more than 100 people were injured on the Greek island of Kos when an earthquake shook popular Greek and Turkish holiday destinations in the Aegean Sea.